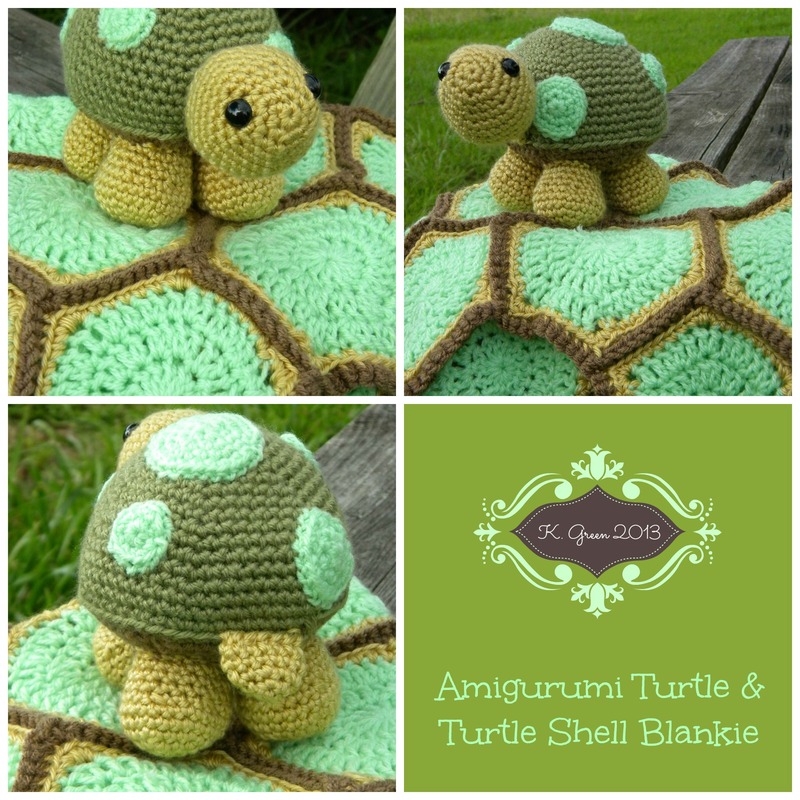 For this project, I used the Turtle Crochet Along Pattern – “Sheldon” from Little Muggles. You can find the free amigurumi pattern for Sheldon here. You can also find Little Muggles on Facebook. I made my first attempt in classic turtle colors in greens and browns as a baby shower gift for a little guy, but a non-traditional version is in the works! I stitched the amigurumi turtle as specified in the pattern using a G-hook (4.00 mm) except I crocheted in the back loops only (BLO) for row 18. This is the row for the color change from the olive green to the brown for the bottom of the shell. Stitching in the BLO helps the bottom of the shell lay more flat once it is stuffed with the polyester stuffing. The black safety eyes are pretty easy to find, but I purchased mine from Joann’s Fabrics. They also come in colors and different sizes if you prefer to change up the look. 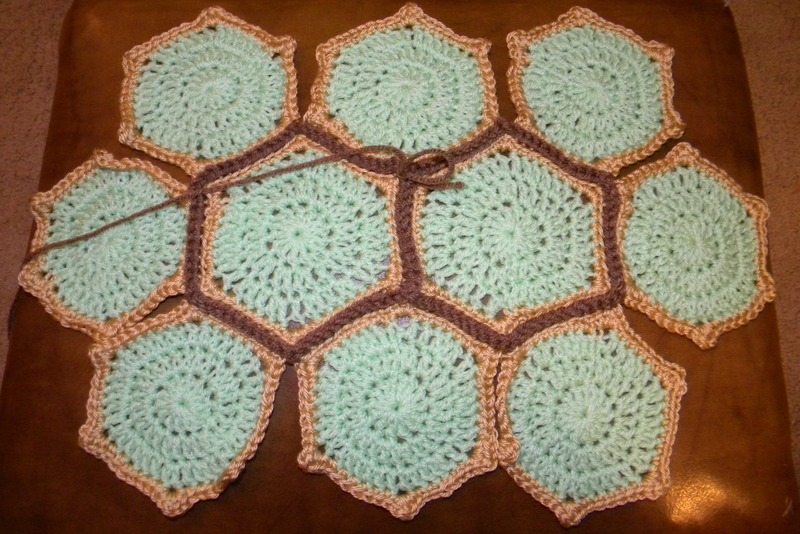 For the hexagon motif turtle shell blankie, I used this free Interchangable Hexagon pattern from Galler Yarns by Marie Segares. I used the circle hexagon option with a few modifications. I used a J-hook (6.00 mm) since the pattern didn’t call for any particular size and I wanted the blanket to be lighter weight for summer and more stretchy. 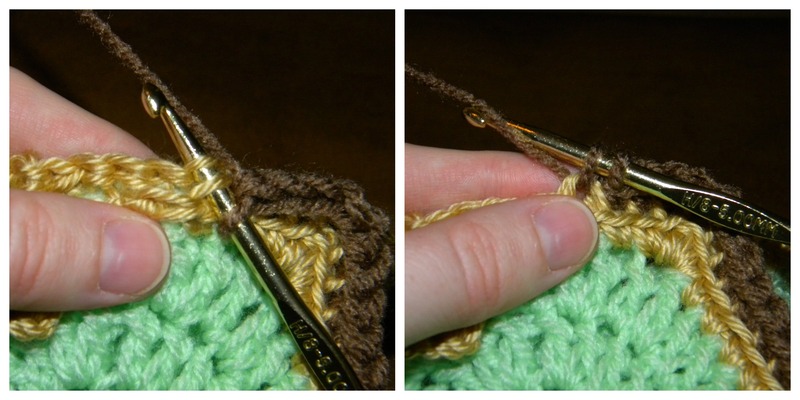 To begin, I used the magic ring method and double crocheted 13 into the ring and joined to the top of the first double crochet. I did not count the chains at the beginning of each round as a stitch and added an additional double crochet in each round as a result. I do this because I don’t like the look of using chain stitches a stitch in the structure of a motif. If this is not your cup of tea or if it makes you nervous to change up a pattern, you are welcome to make the motif as written. It turns out just fine as written. I used the Snuggly Wuggly yarn in Silly Sprite for rounds 1 through 3 then changed color to the Caron Simply Soft in Bone for round 4. I made a total of 31 of the motifs and arranged them in 4 rows of 4 and 3 rows of 5. You can make as many as you wish to make the blankie smaller or larger. The 31 motif blankie was big enough to be used as a car seat blanket. Now, to attach the hexagon motifs together I used the Red Heart in Cafe using a H-hook (5.00 mm). I held two motifs wrong sides together and single crocheted them together in the back loop of each motif. In the corners I worked 2 sc. This takes some time to think through how to arrange your motifs, so you may have to lay them all out on a table or on the floor and make a “game plan” on how you want to attach them. For mine, I started out with a couple of central hexagons, then added hexagons along each edge of the central hexagons and went from there. When you get to the point when you are attaching hexagons together and come across a portion you have already connected, here is what I did to make the connections look more finished. I inserted my hook into the sc near the connection point and slip stitched into it. Just that easy! 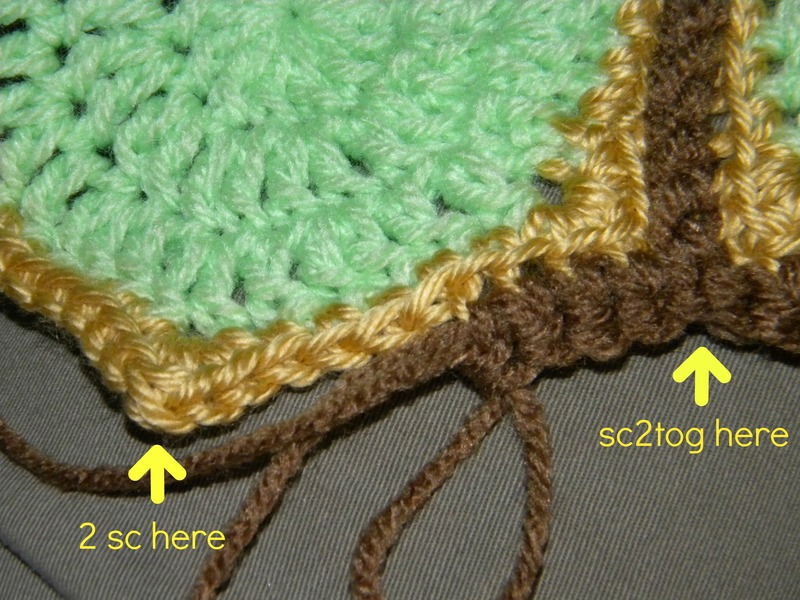 If you just fasten off your yarn at the last sc of the motif connection, you’ll have a gap that doesn’t look quite as neat. For the edging, I used the Red Heart in Cafe and the H-hook and single crocheted around the edge. In the corners that “stick out”, you’ll want to do 2 sc in those and for the corners that “come in” you’ll want to sc2tog over two stitches. This will make the blanket edge lay more flat. After all the motifs are connected and the edging is completed weave in all those ends and you’re done! If you don’t want to make this yourself, I’ll be happy to make a turtle, the blanket, or the set for you! I welcome custom orders.